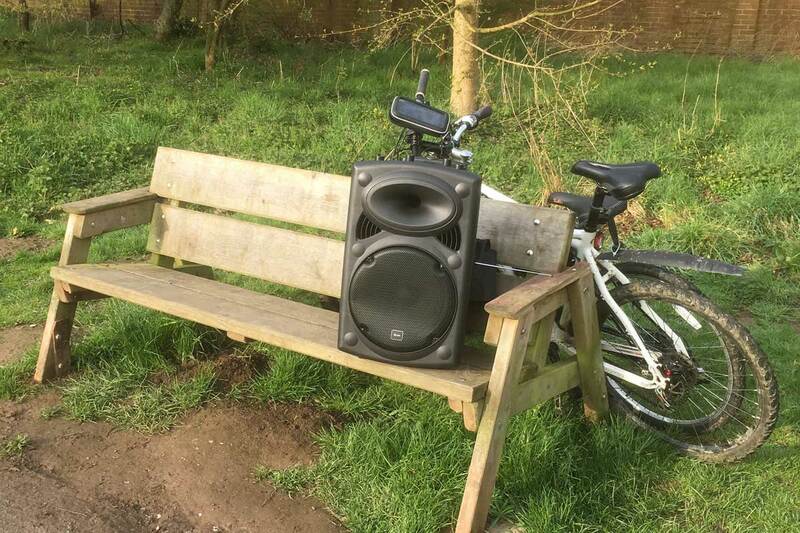 The new public address system "better than the old megaphone"
Oswestry parkrun takes place each Saturday morning at 9am at Henley Wood off Cabin Lane and is a 5km run/walk and its free! After the run, they grab a coffee (and cake!) at the Whole Life Christian Centre. The run is open to everyone regardless of age or ability - everyone just runs for their own enjoyment. It is organised entirely by volunteers and there is a great community spirit there. Parkrun is a fantastic organisation with events, all organised locally, in nearly 600 locations spread over 20 countries. 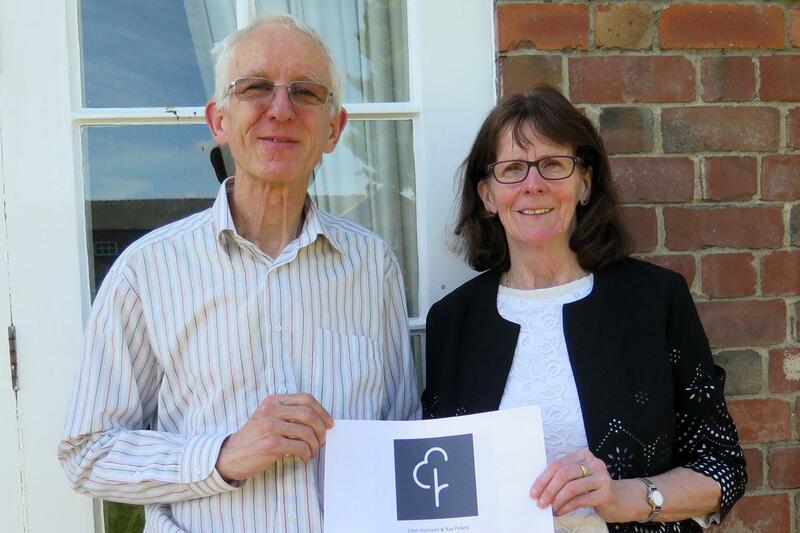 Our Club helped to start parkrun in Oswestry with a grant from the Mary Hignett Bequest Fund and I hope that members will be interested to hear more about it. 1. A gazebo and combined picnic style table & chairs so that we can provide cover for volunteers and in the event of a medical emergency cover for the patient. 2. A portable public address system so that we can brief the runners ahead of the event commencing, this would include safety information, special announcements like a runner or volunteer reaching a significant milestone, and thanking volunteers for turning out to make the event possible. 5. A padlock and chain to secure the equipment into a separate container that has been provided. 6. Two all weather writers to cover associated administration functions at each event. The decision to establish a parkrun for Oswestry came about around September 2017. 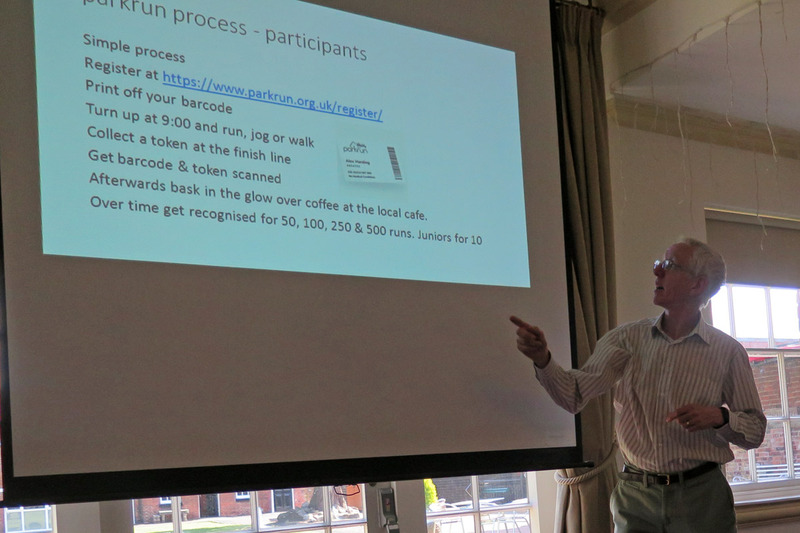 The initial challenge was to find a suitable venue, raise the initial £3,000 required to establish a new parkrun and form a core team of volunteers. A team of 12 people was pulled together by Ellen Harrison as event director, a role now shared with Ray Pickett. The others in the core team come from a variety of backgrounds, including the health profession with one having a specific interest in GP’s prescribing exercise to their patients, but all with an interest in exercise and particularly running. 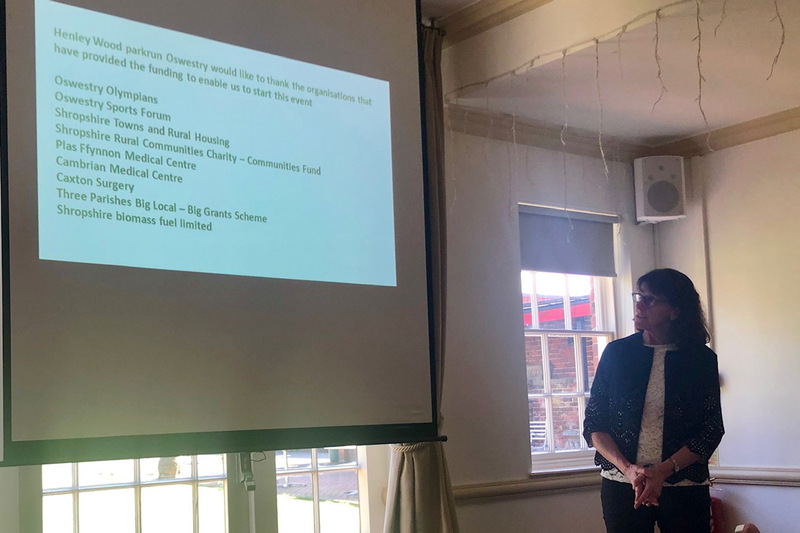 As a result of connections with the health profession, three of the GP practices in Oswestry have provided funding: Plas Ffynnon Medical Centre; Cambrian Medical Centre and Caxton Surgery, as have Oswestry Sports Forum and Oswestry Olympians Athletics and Triathlon club. Other sources of funding for the initial start-up came from Shropshire Towns and Rural Housing and Shropshire Rural Communities Charity Communities Fund. In addition to the original funds Three Parishes Big Local - Big Grants Scheme provided money to enable us to purchase a defibrillator. Working with Shropshire Council Henley Wood was identified as a potential location. A course was worked out through the woodland and park area which requires two laps to create the required 5km distance. Formal permission was obtained and a number of the core volunteers set about preparing the course cutting back over grown woodland and clearing weeds. The local parkrun ambassador assessed the site and gave guidance. In parallel the core team attended other parkruns as volunteers to learn the different roles that need to be undertaken each week. A test event was held in early October 2018 with the support of two running groups - Oswestry Olympians and Girls on the Run. About 50 runners tested the event as if it was being run for real with about 25 volunteers supporting as run director, timekeepers, barcode scanners, marshals etc. This allowed the formal go ahead from parkrun. By 18th November they had held five live events - 168 runners, joggers and walkers were at their inaugural event on 20th October, event #2 saw 202. They have had over 500 different runners over these five events. The fastest first finish so far is around 17.5 minutes and the last finisher around 50 minutes. In this short period of time they have already seen new people registering with parkrun so that they can help as participants or volunteers. The youngest finisher is around 6 years old and the oldest over 75. Each event is run by volunteers, around 30 each week. They are on site from around 8:00am to set up the course and brief the new volunteers on the roles they are taking on, again a wide range of ages - so far 15 to over 70. The run itself is preceded by a briefing to the runners about the course conditions, to remind them it is a shared facility and to thank the volunteers and starts at 9:00am. Once finished the volunteers clear down the course and process the results. They use Café Life at the Whole Life Christian Centre as their base for toilet facilities and post event refreshment and to process and publish the results and sort the finish tokens back into order for the following week’s event. Henley Wood parkrun, Oswestry is a facility for the community provided by members of the community supported by a well-established organisation that has been running for just over 14 years.